A lot of you would most probably know New Balance for their casual sneakers. Besides footwear, however, the company has a diverse product line, and this includes cricket bats. Just like other manufacturers, they are claiming they have products that deliver premium quality. True enough, based on the feedbacks from it’s users, New Balance cricket bats are indeed amongst the best that you can find in the global marketplace. Need more reasons to be convinced that their bats are exceptional? Well, it might help to know that they are used by Joe Root and Gary Ballance, two of the most popular cricketers in England. Both seasoned and casual players choose New Balance because of the unmatched strength and top-notch performance that they deliver. 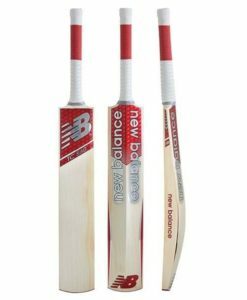 There is an endless selection of models from this brand, but one of the best is probably New Balance DC1080 Cricket Bat. This also happens to be one of the most expensive from their product line. Will it be worth your money? Take a look at their features, and for sure, you will be easily convinced that they can indeed provide the best bang for the buck. Using only the most exceptional clefts, it is used even by international players, such as Ben Stokes. The generous sweet spot, distinctive style, and intelligent weight distribution are just some of the reasons why this deserves to be on the top of your list of choices. Another popular choice is the New Balance TC 1260, which also commands a premium cost. The steep price, however, is compensated with its superior functionality. Joe Root’s bat of choice, it has a mid-swell hitting area, toe guard fitment, and large sweet spot. Regardless of the ball that is used, it will ping efficiently from the face of the bat, which will make you have an amazing play. The chunky and curvy swell is perfectly complemented with the flat face. It is integrated with a six-piece Singapore cane handle with an impressive grip, making sure that you will have complete control of its direction. The DC 880 is one more option that should not be missed for the New Balance cricket bats. The striking look, one of the most common characteristics from all bats from the company, makes it a true head-turner. However, there is more than what meets the eye. The moment you touch it, you can easily understand its popularity. Once you play with the bat, you can be convinced that this is indeed one of the best within the product category. It is endorsed by some of the most popular players in the international scene, including Aaron Finch and Steve Smith. The extra ping that it can provide made it one of the most praised options in the market. For budget-conscious buyers, on the other hand, one of the cheapest products from the company is the New Balance TC 560. The Grade 4 English Willow that is used in the bat allows it to hit with enough power. It can produce a large sweet spot and an amazing ping. Even the design is captivating. It has a 4-piece handle that is made from Singapore cane. Whether you are an intermediate or advanced player, this is another bat you might love. It is not enough that you invest in the right bat from New Balance. The company offers a wide array of other products that will prove to be essentials for any cricketer. The Bat Knocking In and Preparation Service, for instance, will help to condition the bat, making sure that it will perform at its best. To add, you might also want to purchase a convenient bat cover which will provide the protection that is needed from damages that can be caused by external elements. It will be less prone to scratches. This cover also has an adjustable strap, allowing you to carry your bat anywhere. Are you looking for the best New Balance cricket bats? Check out our online store today and be mesmerized by our huge product selection. We carry some of the best products in the market at prices that you cannot find anywhere else. Take advantage of the insane discounts that we are offering! Grab the hottest deals while they are still available!